After launching Cool Burning Studio, you need to insert a writable CD into your disc drive. 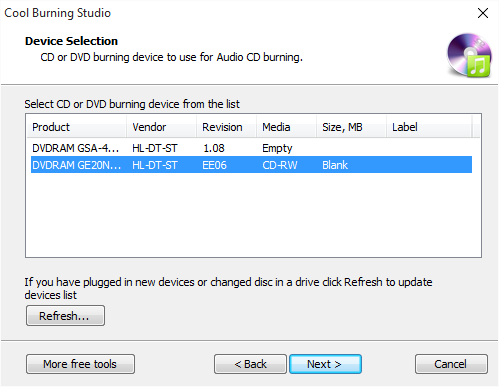 Click “Audio CD” and choose “Audio CD Burner” to run the burner wizard. You will see all the available drives displayed in the list and choose the usable one. If new devices are plugged in or some devices are changed, use“Refresh” to update the device list. 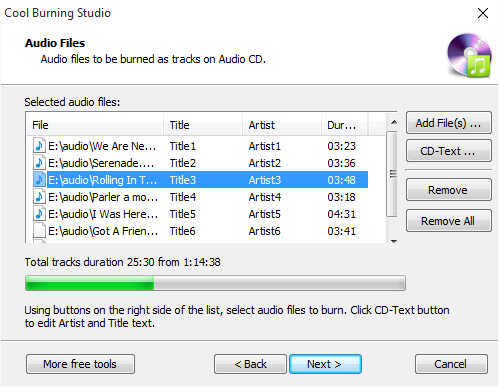 Click “Add File(s)…” to input audio files you like to the burn to audio CD. If needed, you can edit title & artist of every track by “CD-Text…”. To delete files from the burning list, click “Remove”/”Remove All”. 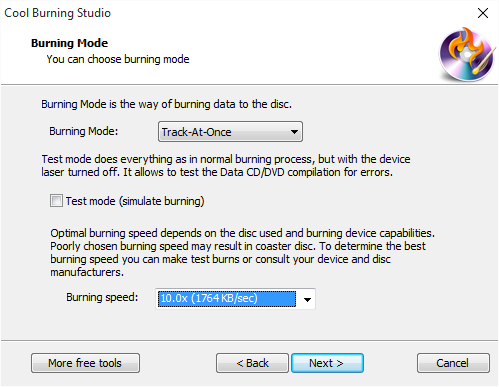 Select one burning mode like Track-AT-Once, Session Track-AT-Once, Disc-AT-Once PQ and Disc-AT-Once raw P-W from the menu of “Burning Mode”. To activate burning for checking errors, you can use the Test mode. After that, choose the proper burning speed. Now, click “Next” to start CD burning and a progress bar will be provided. When the burning process is finished, the disc will be automatically ejected.